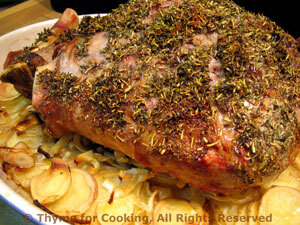 Roast Leg (or Shoulder) of Lamb on Bed of Potatoes, Thyme for Cooking. To get a good leg (or shoulder) of lamb a meat thermometer is invaluable. If possible, get the kind that has a probe into the meat with the display staying outside the oven. That way you don't have to open the oven to check. The potatoes take on the wonderful flavor of the meat and cook down to a wonderful creaminess. Put them in a large saucepan, add chicken stock and bring to a boil over medium-high heat - stirring so they don't stick. Pour the potatoes, onions and stock into a baking dish large enough to hold them and the lamb easily; I use my 10 X 14 inch (25 X 35cm) oval ceramic baking dish. Smooth the potatoes/onions out, cover with foil and bake at 400F (190C) for 10 minutes. Mix the herbs and garlic. Rub the oil on the lamb and sprinkle with the herbs / garlic. Remove potatoes from oven. Remove foil and put the lamb on top of the potatoes. Return to oven, uncovered, and roast for another 30 minutes. Turn oven down to 300F (150C) and roast for another 12 - 15 minutes per pound. Lamb should be 125 - 135F (52 - 57C) Do not overcook or it tends to be dry. Cover potatoes tightly and lamb loosely. Let rest for 10 minutes before carving. Serve all from the baking dish.